The cancer drug Gleevec appears to keep chronic myeloid leukemia at bay a decade into treatment -- with no signs of additional safety risks, a new study finds. Gleevec -- known generically as imatinib -- was hailed as a “wonder drug” when it was introduced in 2001 for treating chronic myeloid leukemia (CML). CML is a type of blood cancer that strikes about 5,000 Americans each year, according to the U.S. National Cancer Institute (NCI). Before Gleevec, a CML diagnosis “amounted to a death sentence,” the institute said. Now, most cases can be controlled, with either Gleevec or related drugs that have been developed since then. The new findings offer more evidence that the early “hype” around Gleevec was correct, said lead researcher Dr. Andreas Hochhaus, of Jena University Hospital in Germany. Of more than 500 CML patients given Gleevec as their initial therapy, slightly more 83 percent were alive 10 years later, the study found. Essentially, their life expectancy was “almost normal,” Hochhaus said. In addition, the study found no evidence of any new, long-range risks from the drug. In the early days, Hochhaus explained, there was concern that Gleevec could eventually raise the odds of other health conditions, such as heart disease. So the new safety data should be reassuring for patients, according to Hochhaus. He and his colleagues report the findings in the March 9 New England Journal of Medicine. Novartis Pharmaceuticals, which makes Gleevec, and funded the research. The study offers some valuable information, said Dr. Michael Mauro, a leukemia specialist at Memorial Sloan Kettering Cancer Center in New York City. So it’s important to have studies that track patients’ long-range outlook -- including any unexpected complications, according to Mauro. Dr. Henry Fung is vice chair of hematology and oncology at the Fox Chase Cancer Center in Philadelphia. He expressed sentiments similar to Mauro’s. Before 2001, fewer than one-third of CML patients were still alive five years after their diagnosis, according to the NCI. With CML, researchers took advantage of the fact that a specific abnormal gene -- called BCR-ABL -- fuels the cancer’s growth. Gleevec inhibits the protein made by that gene. Almost all CML patients respond to the drug -- and usually for years, according to the American Cancer Society. But most people have to stay on treatment indefinitely, which typically means a daily pill. The common side effects include nausea, muscle pain, fatigue and itchy skin rashes. In the new study, 9 percent of Gleevec patients had a side effect considered “serious” -- most often abdominal pain. Those problems were most common during the first year of treatment, then declined over time, according to Hochhaus. Gleevec is not the only drug of its kind: It was the first in a class of medications known as tyrosine kinase inhibitors, or TKIs. Since 2001, so-called “second-generation” TKIs -- including the drugs dasatinib (Sprycel) and nilotinib (Tasigna) -- have been approved for chronic myeloid leukemia. According to Mauro, patients’ overall survival appears to be similar regardless of which TKI they take. But side effects vary somewhat, he said, so that’s one factor in choosing which drug to use. Patients on the newer drugs seem to have a better chance of a “deep molecular response,” Hochhaus said. And that might allow them to try coming off the drug after a few years. But, Mauro said, researchers are still studying whether the newer drugs offer a better shot at treatment-free remission. 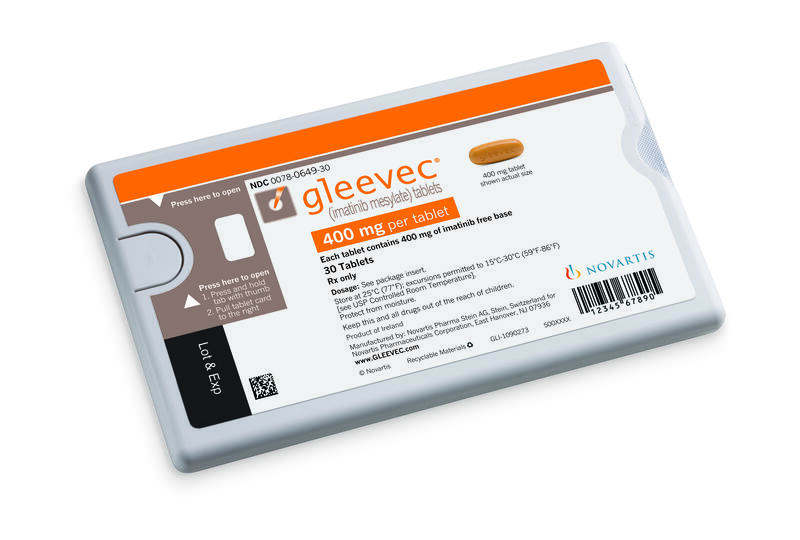 One difference between Gleevec and the newer drugs is clear: The patent on Gleevec expired last year, and it’s starting to become available in generic form. TKIs are very expensive, costing thousands of dollars per month. Fung said many patients may not be able to afford these treatments. The generic form of Gleevec may help. A study last year estimated that five years of treatment with generic imatinib would cost $100,000 less than treatment with Gleevec. There are targeted drugs for certain other cancers, too, Hochhaus pointed out. They include some cases of melanoma and lung cancer where researchers have discovered specific gene mutations that drive the tumors’ growth. Gleevec stands as a “model” for such targeted therapies, Hochhaus and his colleagues said.